The Money Tracker: Find the CASH to Get What You REALLY Want! 20 TIPS TO GET OUT OF DEBT NOW! Think about how your life, your relationships, your job, and your visions for the future could be different if money issues were not dominating your daily thoughts, time and energy. In my 4-Article Series, you’ll learn about the problems many of you experience in dealing with money… and the benefits of arriving at a spending plan that works. Take a moment to read “Making Life Transitions Naturally” where I share my own journey. 1. The Problem – Some of the Personal Budget Challenges You’re Facing. 2. The Cause – Some of the Causes for Your Lack of Financial Knowledge. 3. The Solution – Personal Finance Learning Solutions You Can Use Today. 4. The Benefits – Experience the Benefits of Creating A Personal Spending Plan That Works. or order your copy of The Budget Kit today! … move beyond overwhelm and confusion. … get organized and learn where all your money is going. … get out of debt and be able to save money. … have honest money conversations with your spouse (and yourself). … and most importantly…you can ultimately gain true inner financial peace of mind. Is ‘Life Overload’ Busting Your Budget? 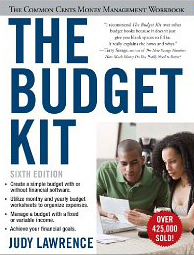 “The Budget Kit” Is The Personal Budget System That Tens of Thousands Have Used To Get Their Financial Lives On Track! Save 23% – by purchasing the eBook and worksheets together, with The Starter Kit. Save 57% – by adding One Hour of Coaching for setting up your worksheets, with The Starter Kit Deluxe Package. Experience the freedom and exhilaration of finally understanding your finances, having your money under your personal control, and savoring your new savings. Not Quite Ready For One-On-One Coaching? 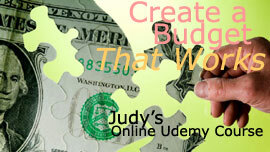 Now take advantage of Judy’s online Udemy course, Create a Budget that Works in the privacy of your home. Create A Budget That Works! are available for Personal Budget Coaching. best money tools out there. "Let's discuss your situation with confidence and confidentiality." "Create a Spending Plan That Works"
Save 57% with The Starter Kit Deluxe Package w/ Set-up Coaching. See how The Money Tracker (Budget Kit) system compares to other well-established personal budget systems. “Working with Judy has helped me bring order to my financial life on a monthly basis and to clarify my big-picture financial goals. Her supportive, practical coaching style guided me towards budgeting solutions and behaviors that fit my own core values and lifestyle, and has given me a greater sense of peace and personal success."